From Harold Bloom, one of the greatest Shakespeare scholars of our time as well as a beloved professor who has taught the Bard for over half a century, an intimate, wise, deeply compelling portrait of Falstaff—Shakespeare’s greatest enduring and complex comedic character. I have longed admired Bloom as a Shakespeare scholar, having devoured his Shakespeare: The Invention of the Human at university, and was therefore interested to see what he had to say on the iconic character of Falstaff. Now, I like Falstaff; I believe I should make that clear before I go on. I have nothing against him and enjoy his witticisms. Bloom, on the other hand, idolises him. This book is essentially a homage to Falstaff, and all Bloom's assertions are skewed in that direction. As such, the writing occasionally devolved into an almost-rant against others. At different points Bloom accuses both Hal and other Shakespeare scholars of wanting to hang the man! It is true that Hal and Falstaff have a complex relationship, but never in all my frequent readings and viewings of the play have I once thought that Hal's focus is on seeing Falstaff hang right from Henry IV Part I, or even later. After all, if this were the case, he could certainly find a reason to carry out this sentence once he ascends the thrown. But he doesn't. 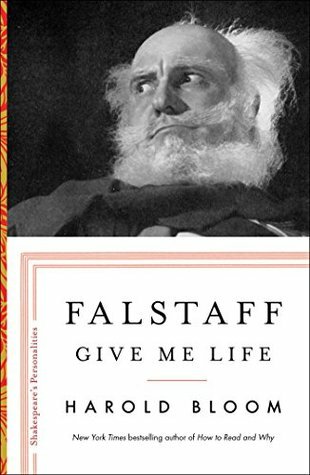 If you are a Falstaff-worshipper like Bloom, you will doubtless love this book. If, like me, you do not share Bloom's absolute devotion, you may find yourself questioning some of his assertions. I closed the final page in agreement with some of Bloom's theory, yet it complete disagreement with others. That's the joy of academia though: there is always a counterargument. My failure to approve of all Bloom's assertion does not, however, mean I did not enjoy reading his portrait of Falstaff, and I would recommend the book to other Shakespeare lovers as an interesting read, even if doing so leaves you with a burning desire to vindicate that sweet wag, Hal.